I’ve been waiting for this offer to come back. I really love these canvas photo prints. We have one of our own but have given several away as gifts. We got our family pictures done in December and I still haven’t ordered any prints. I’ll be getting the FREE 8×10! 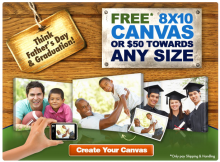 CanvasPeople.com is offering a free 8 x 10 or $50 off any size canvas as a special introductory deal! This coupon can be applied toward a larger size canvas, creative effects or beautiful frames! Head over to CanvasPeople.com and check out this offer.